Can't stop making doilies? Collect doilies and wonder how to display them? Check out How To Turn Doilies Into Dream Catchers. 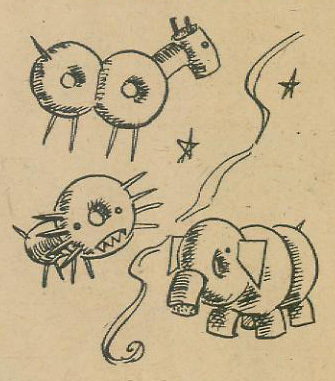 I wrote about collecting old cast iron pans at Collectors Quest. 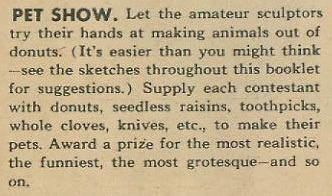 Also at CQ, I discuss what to look for in vintage sewing baskets: part one, part two. When patching sheets, I sew a colored thread in the hem. 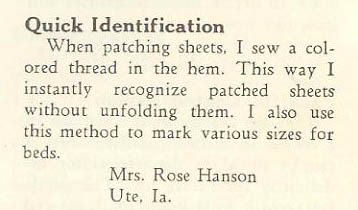 This way I instantly recognize patched sheets without unfolding them. I also use this method to mark various sizes for beds. Have you heard about NerdWallet? It's a site to help consumers save money and make smarter decisions about their personal finances, travel plans, higher education, and shopping -- and now, it's got a new service to help people find and promote indie shops while helping people save money while supporting mom and pop shops online! 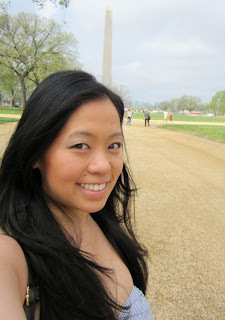 In order to give you all the scoop, I interviewed Rita Chu, Community Manager for NerdWallet Shopping. 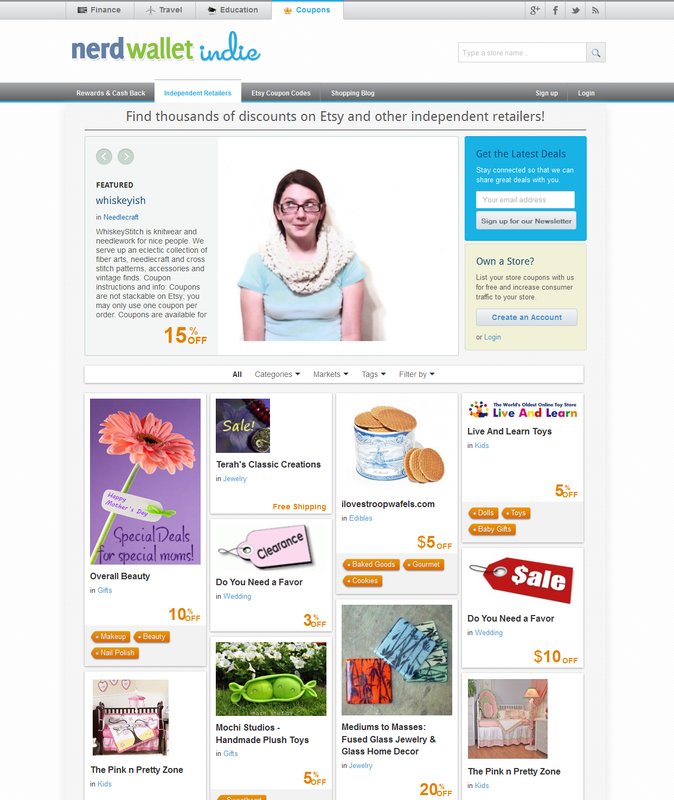 Hi, Rita, give us an overview of the site and the new indie shop opportunity. Our mission at NerdWallet is to help consumers save money and make better-informed decisions. All of our tools help empower people to make better decisions about their personal finances and more through clear and unbiased recommendations and thorough research. NerdWallet Indie was created out of the desire to help consumers save money on online shopping while also supporting handmade artists and independent retailers. 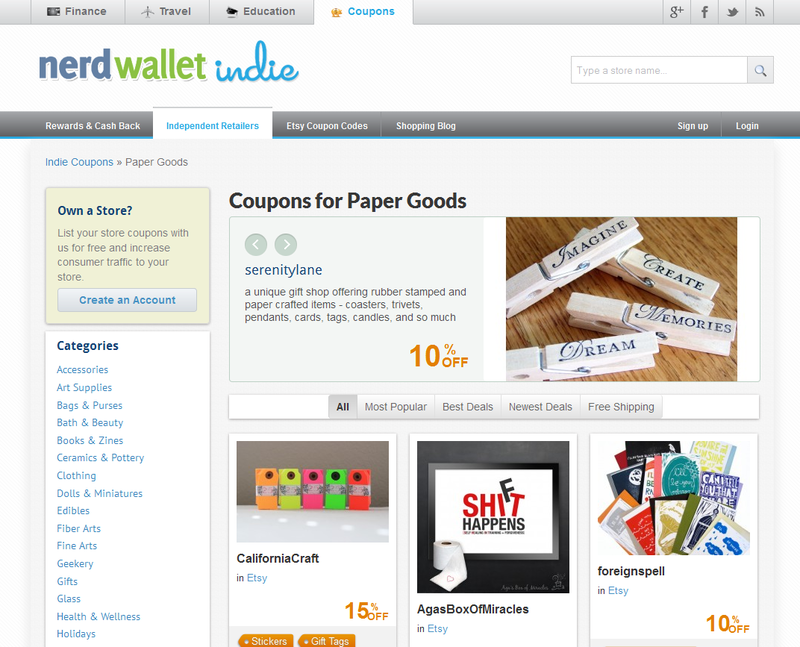 NerdWallet Indie is the best place to discover products and gifts from handmade artists and local small businesses. Everyone needs a little help to save money and hoppers can find great discounts on items like jewelry, toys, housewares, vintage and more that are all made and/or sold by independent artists and small businesses. Furthermore, Etsy sellers and small businesses can share their coupons on our site to promote their work and drive more traffic to their shops. When did the site start? Why was it started? NerdWallet Indie officially launched on November 27th of 2012 to help holiday shoppers save money on handmade gifts. I love shopping for unique handmade finds on Etsy and supporting small businesses so we created a way to help shoppers find great deals on handmade products which also promotes Etsy sellers and other small businesses at the same time. How does a person use NerdWallet Indie -- as a seller and as a buyer? Do folks need to join to participate? Any small business and Etsy seller can join our community and sign up their shops for free to submit their coupons on NerdWallet Indie and also share their social media links, blog and website links too to promote their shops to our thousands of visitors. As a shopper, anyone can browse our beautiful website full of inspiring pictures of lovely handmade products and find that perfect gift for everyone on your holiday shopping list. Just click the "Redeem" button on a coupon and enter the coupon code at checkout to claim your discounts on great holiday presents. How does NerdWallet differ from all the other coupon and sales alert sites? We focus on the independent retailer and small businesses that may have a harder time competing for customers next to big name stores and department stores especially during the holidays. Artists who sell on Etsy can make their products shine with our user-friendly website that features fun Pinterest-style browsing is not flooded with advertisements. Shoppers can find the perfect gift that they are looking for while also finding great discounts to save the money and time. Furthermore, I care deeply about the success of the sellers in our community and work hard to promote all the shops and coupons on social media and news sites all day long. What are the benefits from supporting indie shops, especially at holiday and gift giving time? According to the Small Business Administration (SBA), 97% of all businesses are considered small businesses. Supporting indie artists and your local small businesses is crucial to improving the economy because small businesses have a big economic impact and enrich local communities. Shopping from indie shops, instead of helping big corporations get richer, you will feel good that you're helping people like you support their families and give back to the community which is especially important during the holiday season. If a person has more than one shop, can they manage them under one NerdWallet account? Or must they make individual accounts -- and are multiple accounts by one person even allowed? Yes, one person can manage coupons for multiple stores and each store will have it's own personal coupons page. I see the focus of the site is in Etsy, and that two other sites/platforms/marketplaces (Art Fire and Big Cartel) are also listed. Are any other sales sites allowed? What about places such as eBay, and even individual shops using PayPal, etc.? Can sellers there use NerdWallet? If not, are there any plans to do so? There is mention of offering listings on the site's homepage, prime category listings, and other priority features; how do these work? Is there a fee for that? If a seller adds a link to their store's coupons from their shop or website to promote their coupons, we offer additional features for free that help promote their stores. The seller's coupons will then be displayed on the homepage and at the top of category pages plus the seller can add product images and tags to their coupons to make their coupons stand out and draw customers to their shops. These are all great benefits to online indie retailers which we offer all for free. Thank you, Rita, I'm off to give NerdWallet Shopping a try! 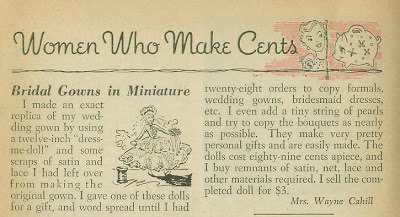 Another tip from the "Women Who Make Sense" section of the Workbasket (June 1956 issue), this one about using the leftover materials from your wedding dress for making a matching miniature dress for a doll. 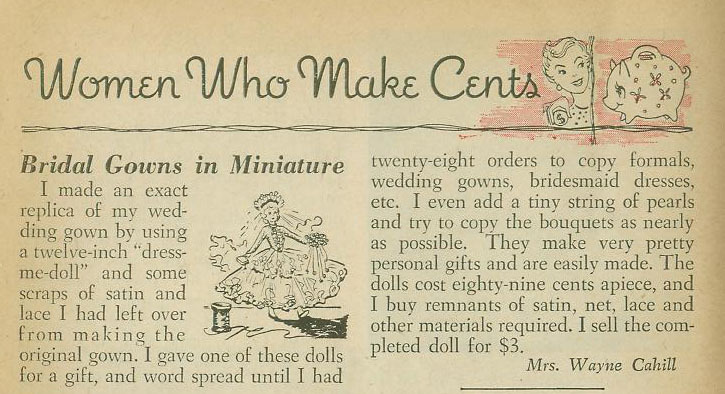 Again, this was an idea for making money, but it's a cute keepsake idea for a bride. 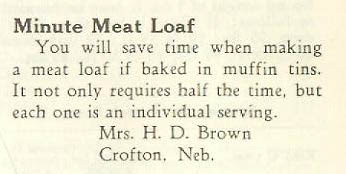 In 1963, Mollie Dowdle wrote this piece which sounds a lot like my post on aprons. It's kind of funny to read that in 1963 aprons were already becoming a thing of the past!